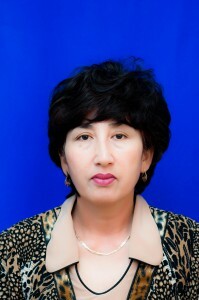 1987-1994 – teacher of German of secondary school “Algabas” of Karaganda region. 2007 – Certificate of short-term teaching at the faculty of professional development of teachers of Public Educational Institution of Higher Professional Training Ivanovo Power Engineering Institute named after V. I. Lenin, Ivanovo Russia. Sofia, Bulgaria “Byal GRAD – BG” OOD 2011.
International research and practice conference MSU of M.Yu. Lomonosov, Gilyansky state University, Russia, Iran 25-26. 03. 2012. Center of scientific knowledge “Logos” Stavropol, Russia, 2013. Center of scientific knowledge of Logos” Stavropol, Russia, 2014. Far Eastern Federal University Ussuriysk, Russia, 2014. 6. Үштұғырлы тіл – бәсекелікке қабілеттіліктің айшықты айғағы. 8. Үштұғырлы тіл – ұлт бірлігін нығайтудың маңызды факторы. International scientific journal “Reporter of ENU named after Gumilev” Astana, Kazakhstan. Humanitarian journal № 1, 2017.